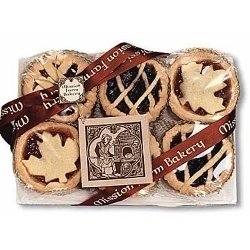 Crafted in Vermont by Mission Farm's resident baker and contemplative Tim Owings, these edible works of art are a feast for the eyes and taste buds. Using wholesome ingredients, he has created a crisp buttery sugar cookie which is subtly flavored with pure vanilla and almond extracts. 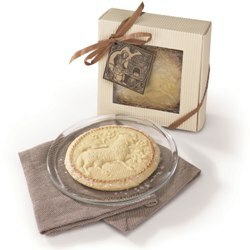 The Paschal Lamb design is made with a reproduction of a 17th century German cookie mold. The edge of each is finished off with a circle of edible gold and crystallized sugar. 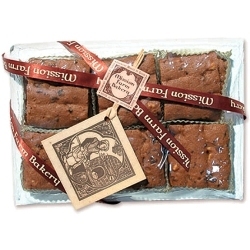 Cookies are approx 4" in diameter, and each gift box contains three. 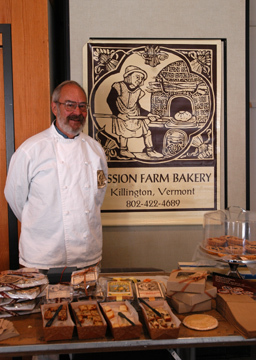 Mission Farm Bakery is located on the 170 acre property of Church of Our Saviour in Killington, Vermont. The historic Episcopal church was built in 1817. In addition to the church, Mission Farm includes a guest and retreat house, a vicarage, and the bakery, staffed by Tim Owings. Since 1997 Tim has lived a contemplative life in a log cabin on the church grounds; after a quarter-century as a professional baker he decided to use his energy and talents to produce cookies, cakes and fruit tarts whose sales benefit the ministries of the Church of Our Savior, including a women's shelter. Owings says, "It's satisfying to know I've helped in some small way." In addition to operating the bakery, he is also the church's organist and gardener. Mar 6, 2018 | By Madeline C.
These cookies are exquisite. Really such a work of art. They will be the highlight of my Easter baskets. They also make a sweet gift for special friends. May 29, 2017 | By betty m.
May 13, 2016 | By Jean L.
Very beautiful cookies depicting the triumphant Lamb (Easter Lamb). Great cookies, too. Worth every penny. These cookies are complete joys for your taste buds. Their clean and honest and homey taste make you think of your childhood and good times with your family. The joy of Easter is recapitulated on your tongue. Mar 25, 2016 | By Maria S.
The friend I sent these to said they were the most impressive cookies she's ever seen!